In my study of end time Bible prophecy I have noticed several key prophecies that are not on most Christian's radar, but should be. Most Christians may know only about the Rapture/ Second Coming and Great Tribulation . 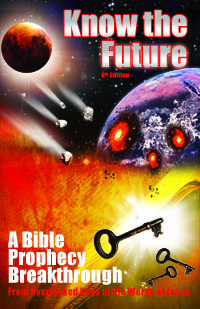 In general they miss that there is much more on the end time prophecy roadmap coming that we will be here to deal with. I was once one of them. That's why I was surprised when I finally caught in my Bible reading that Jesus plainly said that another Elijah "will surely come and restore all things" (Mt 17:11). Even though I had attended churches that taught prophecy, I never heard this detail taught before. I did not know I should expect an "end time Elijah" prophet, or if you will, a "third Elijah" (if you count John the Baptist as the second) (Lk 1:17=Mt 17:11) after the original Elijah of the Old Testament (1Ki 17:1). Luke 1:17 (HCSB) — [Gabriel speaking] And he [John the Baptist] will go before Him in the spirit and power of Elijah, to turn the hearts of fathers to their children, and the disobedient to the understanding of the righteous, to make ready for the Lord a prepared people. Matthew 17:12-13 (HCSB) — "But I tell you: Elijah has already come, and they didn’t recognize him." ... 13 Then the disciples understood that He spoke to them about John the Baptist. Simple, right? John the Baptist was "clearly" Malachi 4's Elijah. That's what many people say and I accepted that. Malachi 4:5-6 (HCSB) — Look, I am going to send you Elijah the prophet before the great and awesome Day of the Lord comes. How could someone coming 2000 years before the Day of the LORD possibly fulfill that part of Malachi's Elijah prophecy? While I had no good answer, I still considered Malachi 4 fulfilled and did not expect another Elijah. That changed when I finally noticed other problematic statements like the "Day of the LORD" one. In these Jesus and John the Baptist himself curiously contradicted the idea that John the Baptist was the final or only Elijah who was to come. How surprising! Along with properly denying to be the Messiah or "The Prophet," John the Baptist also denies being Elijah. Instead he says he is someone else who Isaiah spoke of. Although Jesus identified John the Baptist as Elijah, at the same time he also said, "Elijah is coming and will restore everything." This is unmistakably a future tense statement which negates John being the full/total fulfillment of Elijah. Or does it? To sum up we have two votes that John was Elijah (from Gabriel and Jesus) and two votes that he was not Elijah or was not the only or final Elijah (from John and Jesus). How do we resolve these apparent contradictions? By recognizing that all the seemingly contradictory statements above about Elijah can be true if there are two fulfillments of Malachi's prophecy and therefore two Elijahs are being spoken of by Gabriel, Jesus, John and the Scribes questioning John. In other words, Malachi's prophecy must be a dual prophecy. First coming as Messiah "the suffering servant"
Second coming as Messiah "the King"
This fact was easily missed by the Jews, even though they studied the Bible diligently. They only knew of and expected a Messiah the King to free them from Roman oppression. Thus, when Jesus came as a suffering servant (who did not overthrow the Roman rule), they rejected him. They feared he would only instigate problems with the Romans, causing them to lose their position under Roman authority. Gabriel says John is Elijah (#2), not the final Elijah (#3) (Luke 1:17). John says he is not Elijah (#3) when the Jews ask him if he is Elijah (#3) because they were looking for the final Elijah just as they were looking for the final Messiah, the King (John 1:21). Jesus said John was Elijah (#2) (Mt 17:12). Jesus also said Elijah (#3) "is coming to restore all things" (Mt 17:11). This resolves the dilemma of the Elijah statement contradictions. But it introduces a new dilemma: how do we identify this final Elijah #3?? This is a crucial question for end time believers! Theory #1: "The church fulfills the office of Elijah." Proof? One argument I heard is that because the "Days of Elijah" song is the most popular song in churches (according to Charisma magazine), it means the Holy Spirit inspired this so we would know the church is fulfilling the prophecy of Malachi's Elijah. But this breaks precedent with the first two Elijah's being men and not groups. Theory #2: "The original Elijah will come back." Proof? Some say that Elijah never died and will come back as one of the Two Witnesses. Others say Elijah did die as "no man has ascended to heaven" except Jesus . Either way there is no precedent of a prophet being brought back to resume their ministry after many lifetimes. Theory #3: "Elijah will be a new person." Proof? This is the precedent of Scripture predicting coming figures like the Elijah. Elijah #1 was a new person born of a woman. So was Elijah #2 as John the Baptist born of Elizabeth. Therefore, based on these precedents we could reasonably expect the same of Elijah #3. Most Christians are aware that there are already people who claim to be Elijah or other prophets. Some Christians have been burned by falling for these charlatans. Others are aware that the Book of Revelation says the False Prophet  is coming to delude people into believing lies like the Antichrist is God. This has taught many to ignore all "prophets" in order to protect themselves from deception. It's a reasonable response. So when I come along and say there is indeed a true prophet coming who they must watch for and accept, you can imagine the consternation they feel. How can they possibly identify and accept a true prophet when all they have seen are false prophets who deceive and hurt people? The solution to this problem is to gain discernment from Scripture on prophets. I have had to learn to do that myself as I have had the same negative experiences and observations as others about "prophets." For example, I personally knew someone who died from trusting in false prophecy. They stopped taking their insulin because of a prophecy saying they would be resurrected with a diabetes-free body if they did so. They died needlessly, paying the ultimate price for not being able to "discern the spirits" (1John 4:1). As well, every year a few people always write me to say that they are a prophet, Elijah or even an angel with a message or command for me. Sadly, I've learned to safely ignore them all. They either have mental illness or demonic possession and are beyond my help or convincing. But how do I know who I can safely ignore and when there is a real prophet coming I need to listen to? Aren't I afraid I'm going to screw up and miss the real McCoy? No, I never fear I might misjudge someone who claims to be a prophet. You don't have to either when you understand what Scripture says about prophets of God. It's pretty easy when you know how. 1. True prophets are established through signs, wonders, fortelling. When God made Moses his prophet and sent him to lead Israel, Moses did not take the Christian prophet approach of saying "I'm a prophet of God, believe me and do what I say!" with zero evidence. Moses was able to perform three signs God equipped him with (turning waters to blood, turning his staff to a snake and turning his hand leprous). 1 Samuel 3:19-20 (HCSB) — 19 Samuel grew, and the LORD was with him, and He fulfilled everything Samuel prophesied. 20 All Israel from Dan to Beer-sheba knew that Samuel was a confirmed prophet of the LORD. At this point you may be thinking of John the Baptist who it was said never performed a sign. But he did not have to. It says all the people accepted John as a prophet already for some other reason. It could be his notable near-miraculous birth to a priestly family past the age of child-bearing (Luke 1:7, 18). It does not say. But like Samuel, he was established by God as a prophet so everyone knew. His "reputation preceded him," as it were. Today, there is no Christian prophet like that which the whole nation knows is a prophet already. So if a Christian prophet comes out of the blue with no reputation like Moses did, he had better be able to do signs like Moses or he is not following biblical precedent. He's all wet and we can tell him to "buzz off" with confidence. If you "don't know him from Adam" and he won't do a sign, yet he demands you accept him as a prophet, ignore him. If your request for a sign before you listen makes him angry or causes him to issue threats, he just did you a favor and removed any remaining doubt that he is a man of God! God's prophets obey him in his command to love his children (Mt 7:12) not threaten them from their ego. 2. True prophets speak in harmony with existing revelation of God. 1 Corinthians 14:29 (KJV) — Let the prophets speak two or three, and let the others judge. Isaiah 8:20 (KJV) — To the law and to the testimony [revelation from God given to Israel]: if they speak not according to this word, it is because there is no light in them. God's past revelation is the only valid guide to judge any new wisdom about the future. Anything that contradicts what God has said or leads one in a direction inconsistent with the clear teachings in the nation's traditions is untrustworthy and misleading. The light of God's truth is not in it. There are several other characteristics of true prophets (such as speaking in God's personal name) from Scripture that you can test them by. I cover them in my book Know the Future . Why is Elijah coming and what will he do? Malachi's prophecy quoted above (Mal 4:5-6=Luke 1:17) tells us that he is coming to turn father's and children's hearts to each other. That's a bit ambiguous until you read Gabriel's helpful interpretation of it when speaking with John's father. He said "to turn...the disobedient to the understanding of the righteous, to make ready for the Lord a prepared people" (Luke 1:17). Aha! If John the Baptist/Elijah #2 did that in teaching people the Gospel of the Kingdom  and repentance before the first coming, then we can expect the end time Elijah #3 to do the same before the second coming. This is a needed mission because it's not being done today by Christianity just as it was not being done the first time by Judaism. Both of these Bible-based religions and, in fact, all religions teach the traditions of the holy or exalted leaders who founded or developed that religion rather than the simple Word of God (Mk 7:13). Religion, or traditions of men, is a comforting dead end and only doing the Word of God leads to life (Lk 8:21). Jesus himself said that, "this gospel of the kingdom shall be preached in all the world for a witness unto all nations; and then shall the end come" (Mt 24:14). If Christianity is not teaching this, then when someone like Elijah and the 144,000  finally do (as John, the 72 and the apostles last accomplished 2000 years earlier) it will certainly be noteworthy. A recurring theme among Christians is the hope of "revival." Christians imagine revival in the form of lots of healings or other supernatural signs that lead many "to come to Jesus" and become Christians, like they are. But true revival in the Bible has always come as a result of repentance, or returning to do God's will, or the Word of God (Lk 8:21). That's why it will finally come under Elijah. I believe Elijah has another important role that builds upon him leading a revival. With the disasters and crisis coming to earth caused by WW3, Wormwood  and the Antichrist , God has an escape plan for his people . Someone has to lead God's people to the safe places described as God's people are in ignorance and confusion on what is coming and how God plans to save them (it's not a pretrib rapture ). If God does not send a strong leader who can work signs and wonders or at least make predictions that come true, believers will never know or agree on what is coming or what to do about it and who should they listen to. If Elijah #3 comes in power and authority like Elijah #1 and Moses did, that problem will be solved. I therefore conclude Elijah will be the one "calling" us to "safety"  (Joel 2:32) based on the natural linking between the verse about him in Malachi 4:5-6 and Joel 2:31. They are the only two verses in the Bible using the same phrase "before the Day of the LORD comes:"
Malachi 4:5 (HCSB) — 5 Look, I am going to send you Elijah the prophet before the great and awesome Day of the Lord comes. Joel 2:31-32 (HCSB) — 31 The sun will be turned to darkness and the moon to blood before the great and awe-inspiring Day of the LORD comes. 32 Then everyone who calls on the name of Yehovah will be saved, for there will be an escape for those on Mount Zion and in Jerusalem, as the LORD promised among the survivors the LORD calls. Elijah will be usable by God to call people to safety  as well lead a revival of turning people back to the wisdom of the just (Lk 1:17). When Christians learn about the end time Elijah prophecy, their number one concern quickly becomes how to identify him so not to miss his warning and be "left behind." As you'll understand, spotting or even identifying him won't be much of a challenge compared to acting on what he says. I honestly think it will be near impossible to miss Elijah's coming given the Internet, email, social media and viral video available to be utilized by God. It is promised that the Gospel of the Kingdom  (that I think he delivers first before the 144,000 ) will go worldwide (Mt 24:14). You'll hear about a strange man with a hopeful message of returning to God that lines up with the Bible when you look (Acts 17:11), yet who Christianity calls a "heretic." Therein lies the rub. You'll be swayed at first, yet everyone and everything you hear will make you want to doubt or reject him and his teaching which will contradict much of what Christianity teaches  because he, like Jesus before him is working from God's Word (Lk 8:21) and not from tradition (Mk 7:13). I am confident Elijah can get worldwide attention because over the years I've seen many intriguing—but false—date-setting prophecy theories spread on the Internet like wildfire. All of them are easily refuted with the Bible and always fail, yet they go viral nonetheless because when they are sensational and provocative. No so-called "prophet" behind such prophecy inventions ever succeeds impressively in their prediction even once, let alone twice. Even if they vaguely say "something big will happen"  and it "comes true," it is always so general that nobody is impressed or remembers. But, imagine someone comes along who makes one impressive, specific, mind-boggling prediction after another, that always come true? Word would spread and it would be sensational and spread even more. Yet, unlike a video of a miracle or spontaneous healing, it would leave it up to the hearer to decide if the prediction was a fluke or really a sign from God. They would have to investigate his teaching to see if it aligns with God's previous revelation (Isaiah 8:20), which is no simple task and only for the Bereans (Acts 17:11). If I wanted to reach all believers with the Gospel of the Kingdom , call to repentance and instructions for escaping the beginning of birth pains , I would harness the Web in exactly that way with prediction after a successful prediction. Neither Satan nor the religious folks turned off by Elijah's "heretical" (but Biblical) message would be able to stop it from attracting attention. People are wired that way, to pay attention to the sensational or unusual. Rather than by some impressive recorded miracle, that's how I expect Elijah will get attention and give those seeking to identify him the evidence they need, although ambiguous! Can You Filter Out the Naysayers? John 7:37 — 37 On the last and most important day of the festival, Jesus stood up and cried out, "If anyone is thirsty, he should come to Me and drink! 40 When some from the crowd heard these words, they said, "This really is the Prophet!" 41 Others said, "This is the Messiah!" But some said, "Surely the Messiah doesn't come from Galilee, does He? 42 Doesn't the Scripture say that the Messiah comes from David's offspring and from the town of Bethlehem, where David once lived?" 43 So a division occurred among the crowd because of Him. The same criticisms and misinformed theories will undermine Elijah's work of God so that people who at first were convinced by him will become unsure. That's why I encourage you to stop worrying about missing Elijah or how to identify him. The free articles (and my book) on this site have already prepared you to identify him easily. Worry instead about not being able to stand up against the negativity about him or persecution to do the hard thing  he says to do after you identify him. To know he is speaking for God but be unable to forsake all and disregard the attacks contradicting Elijah's message will be so much harder. As always, I remind you therefore to do what Jesus said to pray for the strength to escape all these things (Lk 21:36) which is even above faith when the end comes! P.S. If you find someone on the Internet and wonder if he is Elijah, don't tell me about him to find out what I think =). There's no need. When the real Elijah comes, we won't have to tell each other about him or seek expert opinions. We will already be hearing about him and he will speak according to the Bible so that we faithful can confirm that he is a prophet of God from our own Bibles. In other words, if you find an 'Eljiah' that everyone is not already talking about at least as a prophet of God—as they did the last Elijah/John the Baptist (Mark 11:32)—then he is not Elijah! Accept no substitutes below Biblical standards even if they meet Christian standards. For more on the coming disasters and God's escape plan that Elijah will share, read my previous article on How We Escape the Great Tribulation . To understand how we know Elijah leads us to immigrate to Israel and why we have to wait until he does, see my later article Elijah's Coming and Immigration to Israel . To learn now what Elijah will be teaching about the Gospel of the Kingdom  , the instructions of Jesus and how to do it, check out my special studies for supporters .